Here are the answers to your burning questions. So you’re checking the weather, glancing heavenwards at the bright orb in the sky, and suddenly, you sneeze. Weird, right? Or what about a random eye twitch, that seems to appear for no reason and go away just as quickly? Or that time you guzzled down an iced coffee, only to grab your head in agony after having a so-called brain freeze? The human body is rife with mysteries, and Dr. Jennifer Caudle, a New Jersey-based family medicine physician and an associate professor in the department of family medicine at the Rowan University School of Osteopathic Medicine in Glassboro, New Jersey, is here to clear up a few of them. Your body's secrets revealed: Why do some people sneeze looking at the sun? Yes, this is a real thing, and it has a name: Autosomal Dominant Compelling Helioopthalmic Outburst (ACHOO) Syndrome. That’s a fancy and long title for sneezing when you look at bright light. Sneezing is usually triggered by contact with infectious agents or after inhaling irritants, but the cause of photic sneezing is not fully understood. It may involve an over-excitability of the visual cortex in response to light, leading to a stronger activation of the secondary somatosensory areas. And guess what? It’s genetic! Wear sunglasses to protect your eyes from direct sunlight whenever possible, especially when driving or operating a vehicle. Everybody yawns, from unborn babies to the oldest great-grandparent. Animals do it, too. But what’s the reason? No one really knows, but there are a lot of theories out there. When we are bored or tired, we just don't breathe as deeply as we usually do. That means our bodies take in less oxygen because our breathing has slowed. Therefore, yawning helps us bring more oxygen into the blood and move more carbon dioxide out of the blood. 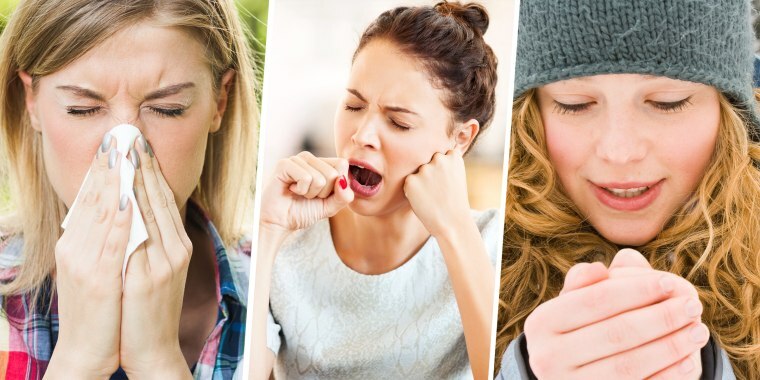 Another theory is that yawning stretches the lungs and lung tissue. Stretching and yawning may be a way to flex muscles and joints, increase heart rate and feel more awake. Yawning can also cool the brain, causing the jaw to stretch out and increase the blood flow to the face and neck. And no one really knows for sure why yawning can be contagious. Call your doctor if you have excessive or persistent yawning. This could be the sign of underlying neurological problems, sleep disorders or reactions to medications. An eyelid twitch is a general term for spasms of the eyelid muscles. The most common causes are fatigue, stress and caffeine; sometimes, dry eyes twitch as well. Once spasms begin, they may continue off and on for a few days. Then, they disappear. In most cases, you won't even notice when the twitch has stopped. Eyelid twitching most often goes away without treatment. But getting more sleep, drinking less caffeine and lubricating your eyes can also help. Call your doctor if the twitching doesn’t go away within one week, closes your eyelid completely, involves other parts of the face or you have redness or discharge from your eye, or eyelid drooping. It’s often called an ice cream headache, and involves sharp, stabbing pain in the forehead. The pain that peaks about 20 to 60 seconds after it begins and goes away in about the same time; it rarely lasts longer than five minutes. This headache happens when cold materials such as frozen drinks or ice cream hit the warm roof of your mouth. Local blood vessels constrict to reduce the loss of body heat and then relax and allow the blood flow to increase. The resulting burst of pain lasts for about 5 minutes. Easy! Just avoid the cold foods that are causing the pain, or eat them at a slower pace. Call your doctor if the headache lasts too long. There are two parts to a hiccup. The first is an involuntary movement of your diaphragm, a muscle at the base of your lungs and the main muscle used for breathing. The second part of a hiccup is a quick closing of your vocal cords. This is what causes the sound you make. Hiccups can start and stop for no obvious reason. Acute hiccups last for minutes to hours and are usually benign and self-limiting and often happen when something irritates your diaphragm. That means if you eat too quickly or too much food; eat spicy foods; drink alcohol or carbonated drinks; feel nervous or excited; or have a bloated stomach. Hiccups usually go away on their own after a few minutes. Call your doctor if the hiccups last more than a few days or keep coming back. Having cold hands even when you're not in a cold environment is common. Often, having cold hands is a part of your body's natural response to regulating your body temperature. If you have ongoing problems with cold hands, there could be a number of causes. Having cold hands could signal a problem with your blood circulation or the blood vessels in your hands or nerves. So, if your digits are cold, warm them up. Call your doctor if your hands are are particularly cold, frequently cold or accompanied by skin color changes, numbness or tingling, sores or blisters.